Frontier Airlines deserves much credit regarding its efforts during the last year to transform itself into an ultra low-cost carrier, most recently evidenced by a 3% drop year-on-year in 3Q2012 unit costs. The airline has also sustained a solid revenue performance during a network revamp that eliminated its underperforming Kansas City and Milwaukee hubs in lieu of seizing on opportunities created by ongoing US industry consolidation. But even as Frontier management has successfully executed a USD136 million cost improvement scheme it initiated in 2011 as part of a broader strategy by parent Republic Airways Holdings to separate the Frontier business, the carrier’s fate remains highly uncertain as the appetite for would-be buyers for airlines in the current macro-economic environment is presumably weak. Still, Republic’s executive management team has declared it is reasonably confident of sealing Frontier’s fate through a sale in early 2013. Underlying that confidence is a performance for 9M2012 that shows the reversal of a year-over-year USD68 million operating loss to a USD26 million profit and the swing from a USD73 million pre-tax net loss in 2011 to a pre-tax profit of USD22 million in 2012. Frontier’s turnaround has encompassed a fleet revamp to cut almost all of the smaller Embraer aircraft from its operations to primarily focus on the A320 family narrowbody aircraft. During 2011 Republic subsidiary Chautauqua Airlines was operating six smaller Embraer ERJ-135/145 in Frontier’s network while Republic Airlines flew 21 Embraer E170/190 aircraft under the Frontier banner. Those aircraft joined 60 A320 family jets with a seating capacity of 120 to 162 seats. By year-end 2012 Republic projects that Frontier will operate 56 A320 family narrowbodies – 16 A320s, 37 A319s and three A318s. During a recent 3Q2012 results discussion Frontier VP of network and revenue production Greg Aretakis explained that with the completion of the sale of five Embraer 190s to US Airways and five of the aircraft being deployed into a charter arrangement with Caesar’s Entertainment, at the end of Jan-2013 only four of the smaller-gauge 99-seat aircraft would remain in the carrier’s fleet. During 4Q2012 Frontier’s Airbus fleet is shrinking by one 120-seat A318 and during 1Q2013 four 138-seat A319s are scheduled for return for lessors. Mr Aretakis stated Frontier was evaluating its options to replace those narrowbody aircraft with larger-gauge A320 family jets. As part of its cost improvement programme, Frontier in early 2012 undertook a project to add six additional seats to its A320 aircraft for a total of 168. The carrier estimated the reconfiguration of the larger narrowbodies would produce a 3% drop in its unit costs, which excluding fuel fell 5.7% to USD 7.61 cents during 2Q2012 and 3.6% to USD6.86 cents during 3Q2012. Frontier’s USD6.86 unit costs recorded during 3Q2012 is a 9.7% drop from the USD7.60 cent unit costs it posted for the full year 2011, which was a 3.8% year-over-year increase. But the carrier’s unit costs remain higher than those of the other ultra low-cost carriers it aspires to mimic. Frontier’s unit costs were roughly 12% higher than the USD6.02 cents recorded by the carrier that coined the phrase ultra low-cost carrier, Spirit Airlines, and nearly 24% more than the 5.37 cent unit costs Allegiant posted during 3Q2012. Frontier’s work to decrease its unit costs during 2Q2012 and 3Q2012 was not mimicked by ultra low-cost pioneer Spirit Airlines, which increased its unit costs nearly 5% during 3Q2012 and roughly 12% during 2Q2012. But the carrier is working to combat the cost creep, and has guided to a 2%-3% unit cost decrease to between USD5.90 cents to USD5.95 cents during 4Q2012. Allegiant expects its unit costs to fall nearly 6% year-over-year during 4Q2012 to USD5.37 cents. If those carriers meet those targets, Spirit and Allegiant could further distance themselves in the ultra low-cost contest from Frontier, a scenario that will not escape the scrutiny of prospective acquirers of the carrier. Frontier’s unit cost progress has also been accompanied by growth unit revenues, which increased 5.4% during 3Q2012 to USD12.33 cents, versus USD11.33 cents at Spirit and USD11.86 cents at Allegiant. Frontier achieved its unit revenue growth on a 4% decrease in capacity year-over-year during 3Q2012 and a 2.9% rise in the carrier’s average stage length. A significant portion of Frontier’s unit revenue improvement during 3Q2012 is the carrier’s wind-down of hubs in Kansas City and Milwaukee and a renewed focus on maximising its Denver hub. The carrier has estimated that during 3Q2012 Denver represented 87% of its capacity compared with 78% during 3Q2010. During that time Milwaukee’s percentage of Frontier’s total capacity has dropped from 16% to 1% while Kanas City’s share has fallen from 5% to 1%. Denver has long been Frontier’s main base of operations, and a decision by Republic to move Frontier’s headquarter to Republic’s base in Indianapolis was later reversed given Frontier’s deep ties to Denver. 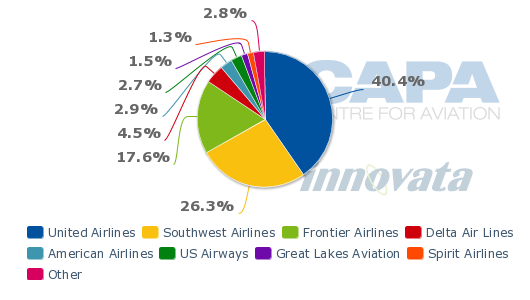 Based on current schedules in Innovata for the week of 12-Nov-2012 to 18-Nov-2012, Frontier accounts for 18% of the seating capacity in Denver, third behind United’s 40% and Southwest’s 26%. 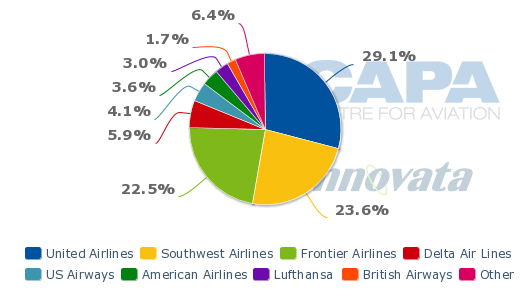 But on an ASK basis, Frontier’s 23% share is just shy of the 24% held by Southwest. Frontier has benefitted during 2012 from what it has often characterised as a “calm” competitive environment in Denver, which has aided the company’s unit revenue performance in 2012, as evidenced by a 6.8% increase year-over-year during 9M2012 to USD11.98 cents. During 4Q2012 Frontier expects domestic capacity in Denver to rise 3.5% to 4.5% year-over-year, and estimates a 2%-4% decrease in the airport’s supply during 1Q2013. Frontier is responsible for some of that drop as it plans in Jan-2013 to cut service from Denver to four markets in Jan-2013 – Akron/Canton, Ohio; Louisville, Kentucky; Philadelphia, Pennsylvania; and Sacramento, California. Some of those changes reflect Frontier’s apparent preference to mimimise competitive overlap with Southwest in Denver, as Southwest serves all the markets being eliminated. United does not serve Akron-Canton, but operates in the remaining markets of Louisville, Philadelphia and Sacramento. Frontier is pulling out of Denver-Louisville shortly after Southwest introduced non-stop service on the route in Nov-2012. As it worked to re-fortify its Denver hub, Frontier opted to largely look for route pairings uninhabited by Southwest rather than attempt to compete with the Dallas-based low-fare carrier, which Frontier contends has practiced predatory pricing and capacity dumping. In filings with US securities regulators, Republic stated that on 15-Feb-2012, Southwest detailed a system-wide fare increase of USD10 per ticket, except in Denver. To combat some of the negative implications of Southwest’s competitive tactics in Denver, Frontier during the summer of 2012 launched service to several new markets not served by Southwest – Cedar Rapids, Iowa; Great Falls, Montana; Bellingham, Washington; Harrisburg, Pennsylvania; and Bloomington, Illinois. United Airlines serves Cedar Rapids and Great Falls; but Frontier and United are long-time competitors in Denver, and it would appear that United doesn’t engage in the same competitive tactics as Southwest. Overall, Frontier has declared it has been successful with its strategy of opting to curtail overlap with Southwest from Denver. At the same time Frontier has renewed its focus in Denver, the carrier has also recognised that it needs to make tactical moves outside its home base. Along with Allegiant, Frontier has moved to fill some of the gaps created by the merger between Southwest and AirTran as Southwest opted to cut small and unprofitable routes from AirTran’s network. During Nov-2012 Frontier is making a push from Orlando, where it has introduced new point-to-point service within the last year. The latest markets introduced in Nov-2012 are Trenton, New Jersey and Greensboro, North Carolina. Frontier’s other recent markets from Orlando include Allentown and Harrisburg, Pennsylvania and Bloomington, Illinois. All of those markets were served by AirTran, and presently Allegiant Air operates service to Allentown, Bloomington and Harrisburg from its base at Orlando Sanford Airport. During 2012 Frontier has also commenced a major expansion from Colorado Springs, located 109km south of Denver. The carrier has rolled out new service in two tranches – Phoenix, Arizona; Portland, Oregon; Seattle, Washington; and Los Angeles, California in May-2012, and San Diego, California; and Orlando, Florida in Nov-2012. Allegiant, American, Delta, Frontier and United all serve Colorado Springs, but the legacy airlines serving the airport use the market as a spoke for their hubs, and Allegiant operates service to its larger bases in Phoenix Mesa and Las Vegas. Frontier is uncontested in all but one of its markets from Colorado Springs. The carrier competes with United on service to Los Angeles. It will take some time to determine if Frontier’s diversification efforts from Denver into smaller cities will prove successful, but the airline’s unit revenue growth during 3Q2012 shows the scheme has some promise. Beginning in Nov-2012 Republic is formally commencing the process of meeting with prospective and strategic and financial buyers, “and sharing the vision for what Frontier can become as it continues its transformation into an ultra low-cost carrier”, stated Republic CEO Bryan Bedford. But the level of interest Frontier is generating among potential suitors remains murky. Earlier in 2012 Frontier was listed among five carriers as possible merger partners for American Airlines as that carrier attempted to deflect buzz around US Airways’ attempts to craft a merger with American. 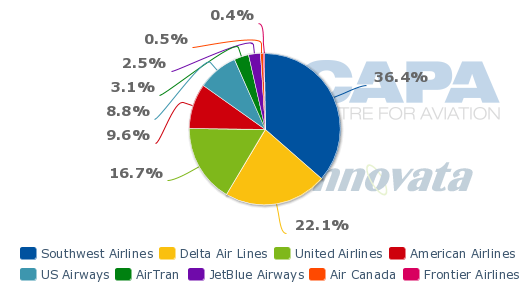 Other possible carriers listed by American included Alaska, JetBlue, US Airways and Virgin America. The possibility of any of those carriers pursuing Frontier is fairly remote. Frontier’s attractiveness to any network carrier is extremely limited as most US legacy airlines already serve Denver and have no desire to either deepen their ties there or further intensify competition with Denver’s largest carrier United. Alaska, JetBlue and Virgin America have a somewhat similar product offering to Frontier, but Alaska and JetBlue have repeatedly stated their desire to remain independent and grow organically, and Virgin America’s investors are patiently waiting for that carrier to turn its first annual profit after five years of operations. Reports have emerged that a group of investors in Louisiana have an interest in purchasing Frontier and relocating the carrier to New Orleans International Airport, but uprooting Frontier from Denver after it appears to have crafted a strategy for effectively dealing with competitors in Denver would be ill-advised. New Orleans is more of an O&D market, which would create challenges in building up a viable operation at the airport. Frontier would also heighten competition with Southwest, which is New Orleans’ largest carrier in terms of seats accounting for a 36% share. Frontier has spent the last couple of years purposefully avoiding competition with Southwest. As the appetite for any traditional suitor to purchase Frontier remains uncertain, Mr Bedford and Republic stand ready to officially offload Frontier in 2013. He remarked that if some exogenous industry event makes it difficult to sell Frontier, then Republic would opt to spin Frontier off through an initial public offering. Frontier’s turnaround in a relatively short period of time definitely warrants applause, but whether the performance is strong enough to sway potential buyers – inside or outside the aviation industry – into making a gamble on the airline’s viability remains highly uncertain even if extraordinary events in the aviation business do not occur in the upcoming months.